For the first time, the 3 series will be offered in three trim and equipment levels: sport, luxury and modern. BMW of North America will raise prices by less than 1 percent on its top-selling car, the 3-series sedan, when a redesigned version goes on sale in February. The 2012 328i sedan will start at $35,795, up $320 from the model it replaces, and the 335i will go up $370 to $43,295, the automaker said today. Both prices include an $895 destination charge. BMW said the cars will have more equipment than the models they replace, including a 6.5-inch central display with its traditional iDrive controller for audio, climate and other settings. The cars will also have a USB/iPod interface, an eight-speed automatic transmission, a start/stop function and brake-energy regeneration. The redesigned versions may give the automaker a boost next year in what could be a bid to retain the title of top-selling luxury brand in the United States. Through October, BMW led Mercedes (excluding Sprinter vans) by about 7,000 sales and had more than a 45,000-unit lead over earthquake-hampered Lexus, the perennial No. 1. Last year BMW sold 100,910 3-series cars in the United States, significantly beating the second-biggest seller in the compact luxury sedan segment, the Mercedes-Benz C class (58,785) and the Infiniti G (58,143). Through October, BMW sold 78,314 3-series cars. The 328i sedan will have a new 2.0-liter twin-turbo four-cylinder engine, and the 335i will continue to feature BMW's twin-turbo 3.0-liter inline six-cylinder powerplant. Both engines are gasoline; a diesel will be added later. 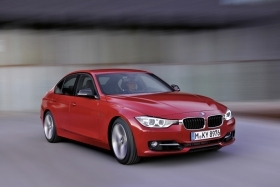 The 2012 3-series sedan will make its U.S. debut at the Detroit auto show in January.